Summary: Clayton Byrd is happiest when he’s playing the blues with his grandfather, Cool Papa Byrd. Cool Papa gives Clayton a harmonica, or blues harp, and lets him play it in his band; Clayton dreams of the day he’ll be allowed to play a solo. When his grandfather suddenly passes away, Clayton is overcome with grief, intensified by his mother’s apparent lack of caring. When she declares, “no more blues”, and takes away his blues harp, Clayton knows he has to do something. He takes a day off from school, steals back his harmonica, and boards the subway in search of Cool Papa’s old band. Along the way he loses both his blues harp and the treasured hat that belonged to his grandfather, falls in with a group of hip-hop artists that take their music onto the subway cars, and almost ends up in jail. His mother comes through for him in the end, and the two of them develop a new appreciation and understanding of each other. An author’s note tells more about blues, hip-hop, and how she came to write this book. 176 pages; grades 3-7. 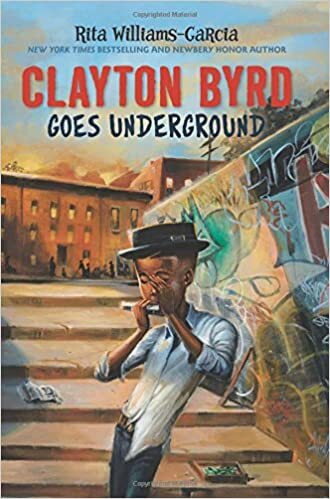 Pros: Newbery and Coretta Scott King honoree Williams-Garcia has created another sympathetic character in Clayton Bird, exploring the richness of blues and hip-hop cultures through his experiences and interactions with other fascinating characters. Cons: The story was too short to be as fully developed as One Crazy Summer and its sequels.